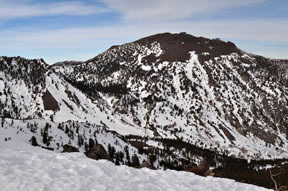 You should choose to traverse the ridge of which Tamarack Peak is the highest point for the unique experience but in doing so you will in all likelihood spend time climbing up some crappy snow or even carrying your skis over some short stretches of snow-barren ground. It's still a great trip. 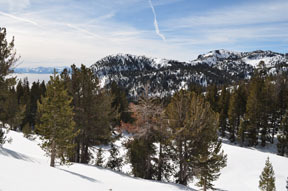 But if you simply want to gain the view from the summit and enjoy 850 feet of modestly steep continuous gradient on the descent, then you probably will find the Tamarack Peak Direct tour more to your liking. This loop tour is a combination of skiing on a rather well-used road, climbing the relatively narrow ridge, and the final descent down the south-facing slope where the snow turns to corn quickly. Also the trees are scattered on the descent, which makes for fun turning through them. But don't go here when it has been windy; without any protection from westerlies the slopes become icy just as quickly. 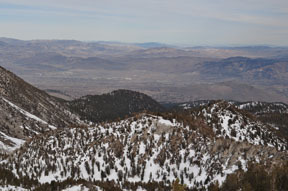 From the route up and down, as well as obviously from the summit of Tamarack Peak, the views are superb. 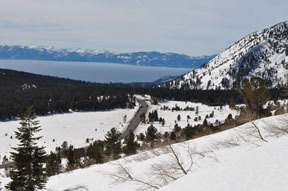 To the south and southwest are Tahoe Meadows, Lake Tahoe and the ridges above Ginny Lake. 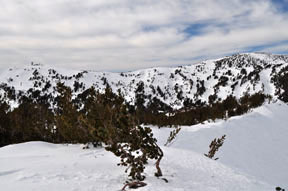 To the west is Relay Ridge, the border of the Mount Rose Wilderness, and to the north is Mount Rose, the highest peak in the greater Lake Tahoe area at 10,776 feet. But don't be surprised if the face of Mount Rose is barren. Finally to the east is Washoe Valley far below. A final note about the section of the tour along the road to Relay Ridge is prudent; it is heavily used, but don't be discouraged; you will probably be blazing your own trail once you leave it and begin to climb. 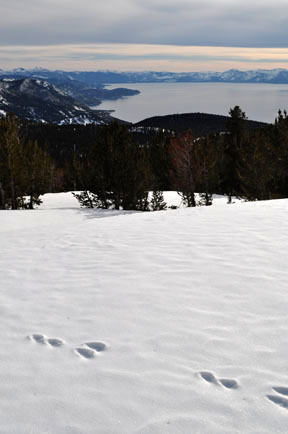 You may also find lots of tracks on the summit. These come from the telemark skiers, AT skiers and boarders who ascend a different route for the opportunity to ski down one of the steep routes on the northeast side of the peak. From the trailhead (1) ski west on the snow-covered road, which gradually turns north up the Third Creek drainage, for a total of 2.5 miles until you reach a saddle (2). The saddle separates Third Creek and Galena Creek. 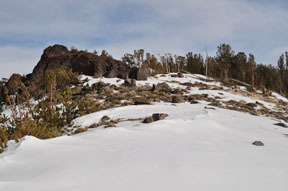 Ascend the narrow ridge to the east (right) for 0.2 mile until you reach a red rock outcropping (3). You can start the ascent slightly on the north side of the ridge where you might find more snow but you will want to move onto the ridge shortly. 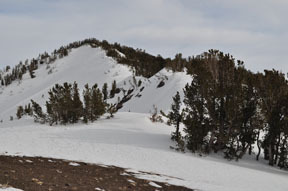 Continue southeast on the ridge, shortly cross a broad saddle and finally pick you way through and around wind ravaged trees for a total of 0.5 mile until you reach the summit of Tamarack Peak (4). 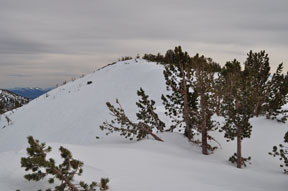 Descend southeast for 0.4 mile and then south for 0.4 mile until you reach the road to Relay Ridge (5). 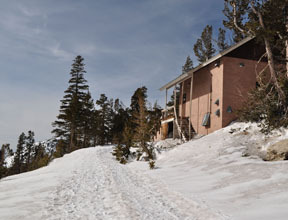 Ski east (left) on the road for 1.0 mile until you reach the trailhead (1).